This was a tour with returning guests from South Africa birding the Iron Range region in Far North Queensland. The aim was to see as many of the endemic bird species in the Far North as well as visit the Atherton Tablelands. The 9 day tour took us down to Etty Bay, south of Cairns, up into the Tablelands and then north to Iron Range concluding at Weipa. It was just after the wet season so the grass was high and the rainforest and woodlands were pristine. Some of the migratory birds that should have normally headed further north were still around which was a bonus. Despite being out of breading season there were plenty of birds and other animals wherever we went. The roads have been improved since our last visit and this looks to continue for many years. We finished with a grand total of 201 species, many of which are endemic to the region. Following is the daily summary and bird checklist. The tour started with an early pick up of 2 of the guests from Cairns airport, who had only just arrived from South African via Perth. After a reunion with the early arrivals at our hotel and a hearty breakfast we walked across the road for a bit of foreshore birding. Though it is out of the main migratory shorebird season, we still managed a good number of waders including Terek Sandpiper, Grey-tailed Tattler, Great and Red Knot. To the north of the esplanade we got onto Leaden Flycatcher, Varied Honeyeater, Nutmeg Mannikin and Mangrove Robin. After packing the car we headed south. A quick stop on the way netted White-bellied Sea-Eagle and Wedge-tailed Eagle. At Etty bay we stopped for lunch with the obligatory Cassowary walking along the beach. The trip up to the Atherton Tablelands enabled us to stop briefly at the Nerada Tea Factory for Lumholtz’s Tree-kangaroo. We were also rewarded with a great selection of bird specialties including Victoria’s Riflebird, Spotted Catbird, Fairy Gerygone and Hornbill Friarbird. Overnight was at Kingfisher Park. Up not too early as we headed out for a day around Julatten and Mt Lewis. Julatten scored us the local residents around Kingfisher Park including and very quiet Noisy Pitta, Lovely fairywren, Shining Bronze-cuckoo, and a very obliging White-eared Monarch. Mount Lewis was excellent with all the residents including Golden Bowerbird, Chowchilla, Fernwren, the northern form of the White-throated (Little) Treecreeper and Musky Rat-kangaroo! A quick spotlight on the way home saw us getting Papuan Frogmouth over the river. The highlight of the day though was at 9pm back at Kingfisher Park as I was washing up, Lesser Sooty Owl called directly outside. After a quick view and photo I was able to get all the folk onto a pair busy calling to each other. Brilliant. The call was continually heard through the night. Was spent again around Julatten cleaning up the ones we missed yesterday while chasing the harder ones. We then headed further afield for other birds including Squatter Pigeon, Yellow-breasted Boatbill, Yellow Honeyeater and Pale-headed Rosella. Highlights included White-browed Crake, a late departing Pied Monarch, Eastern Koel, Spectacled Monarch and an array of Honeyeaters. Back to Kingfisher and a quiet stop at the Crake pool was well worth it as just as the light was almost gone, a Red-necked Crake came in for a bath. Great views under a torch light while it put on a great show. An early start today enabling us to do the next 400km with ease. Australian Bustard appeared along the road in the first 15 mins. A quick stop further north afforded us great views of the elusive Black-throated Finch, and the northern form of Brown (Black) Treecreeper. A coffee stop at Laura gave us our first Black-backed Butcherbird at the café. On to our next stop at Artemis Station. Here we were welcomed by Kerri, Tom and Sue Shepherd’s daughter, her kids and Snowy the dog. Off we went by foot (us in hiking boots, the kids in thongs) for a look at the nest site of the endangered Golden-shouldered Parrot. We had a peek into the nest which is a hollowed out cone shaped termite mound. Only 1 adult turned up but was not interested in coming to the nest so not all the team saw it. The decision was made to return the following morning. We then headed up the now sealed road to the Musgrave roadhouse, our stop for the evening. John and Mary are great hosts and also provide excellent meals. Other great birds included Black-breasted Buzzard and Brolga. An early start saw us back at Artemis Station at first light. Within an hour both the male and female Golden-shouldered Parrot came in for superb views. During the wait, Red-winged Parrots, Varied Triller, a lone male Satin Flycather, White-bellied and Black-faced Cuckooshrike all made an appearance. Back to the Roadhouse for a scrumptious breakfast and then off again further north. A few roadside stops saw us get Brown Falcon and Collared Sparrowhawk. Soon we were turning off the main highway and heading along the last stretch to the town of Lockhart River, the gateway to the Iron Range National Park. This last section was the slowest going but still great in comparison to some years ago. We arrived at our accommodation for the next 4 nights “The Greenhoose” greeted by our host Stu. As we had made it in good time we quickly unpacked and headed into the rainforest for our first taste of this amazing region. We quickly had Red-cheeked Parrot roaring by overhead along with unconvincing views of Eclectus Parrot. Magnificent Riflebird made their presence known and it soon became too dark (at 4pm) to see much else. We decided to head to the beach as the light was much better. Here we saw Beach Stone-curlew and Greater Sandplover. A quick stop at the wastewater treatment plant netted us a pair of Radjah Shelduck. Our first full day in Iron Range saw us early in the rainforest. White-faced Robin presented well, so too did Frilled-necked Monarch. Wompoo Fruit-doves called from the thick forest but played hard to get. Next we headed to the beach-side town of Portland Roads. Both Lesser and Grater Frigatebird displayed overhead. Olive-backed Sunbird had built a nest directly above the road so were very easy to find. At Chilli beach around the corner we had Reef-egret on the beach and very flighty Rose-crowned Fruit-dove in the bush. It was raining a little so we decided to head back to the rainforest. We did some serious bush bashing but still no decent views of Eclectus Parrot. Early trip back to camp as we were going spotlighting that night. We had a large unidentified Python on the road but the birding was quiet except for a number of Marbled Frogmouth who refused to co-operate, calling from deep in the bush. Today we chose to start close to home base and a location called the Mango Farm Dam. Here we quickly picked up a very obliging Yellow-billed Kingfisher. Others included Green Pygmy-goose and Shining Flycatcher. Next we dropped back to the house for coffee. As we arrived a late staying Black-winged Monarch was spotted with young: brilliant. So too, Tawny-breasted Honeyeater. A quick sojourn into the mangroves at the back of the Greenhoose soon had us on to a skulking Northern Scrub-robin. After lunch we headed back into the Rainforest and picked up Trumpet Manucode, Lemon-bellied Flycatcher, and a stunning male Magnificent Riflebird displaying for us all. As it got dark we decided again to head to beach and this time Palm Cockatoo gave us stunning views. Our last full day and we were in the forest again searching for Eclectus Parrot. Plenty of calling birds but none showing. We did however pick up Tropical Scrubwren. We headed on to Portland Roads township and searched the mangroves. Here we encountered Large-billed Gerygone, Brown-backed Honeyeater, White-throated Gerygone and Black Butcherbird. The highlight was a pair of Double-eyed Fig Parrots perched 10 meters away. This was much better than the usual views of a small speck rocketing across the sky. We checked a few more spots for Eclectus Parrot with no success until we were almost out of the rainforest. We heard a number in one location and I knew there was an old nest site near there. We drove back and not 5 meters from the nest site sat a glorious female Eclectus Parrot. One of the guests had skipped the day as he had flu. On our return I grabbed him and headed back to see if the Eclectus was still there. Sure enough, there she was and James was forever grateful. The evening was highlighted with fish and prawns wonderfully prepared by our hosts Stu and Lynn who then joined us in a wine and sing along in to the late hours. Our final morning at Iron Range and we then then started the journey along the access road to our final destination, Weipa. Spotted Whistling-duck had been seen at the Archer River dam. Although it was a 70 km detour, we decided it was worth a shot so we headed there and sure enough 10 Spotted Whistling-duck were there in amongst 80+ Plumed Whistling-duck. We celebrated our success with a nice hamburger at the Archer River Roadhouse. We headed for Weipa some 200km north and arrived in good time to freshen up before our final dinner, gaining Spotted Harrier along the way. We decided on an early dash to the wastewater treatment plant at Weipa to see what else we could find. Other than a few Pink-eared Duck and Black-winged Stilt the ponds were quiet but the bush just north delivered some great birds including Red-headed Honeyeater. Back to the hotel for breakfast and the resident roosting Papuan Frogmouth. Our last bird for the trip was on the way to the airport. An obliging Red-backed Kingfisher sat patiently on the power lines not 1km from the carpark. This took our final tally to 201! 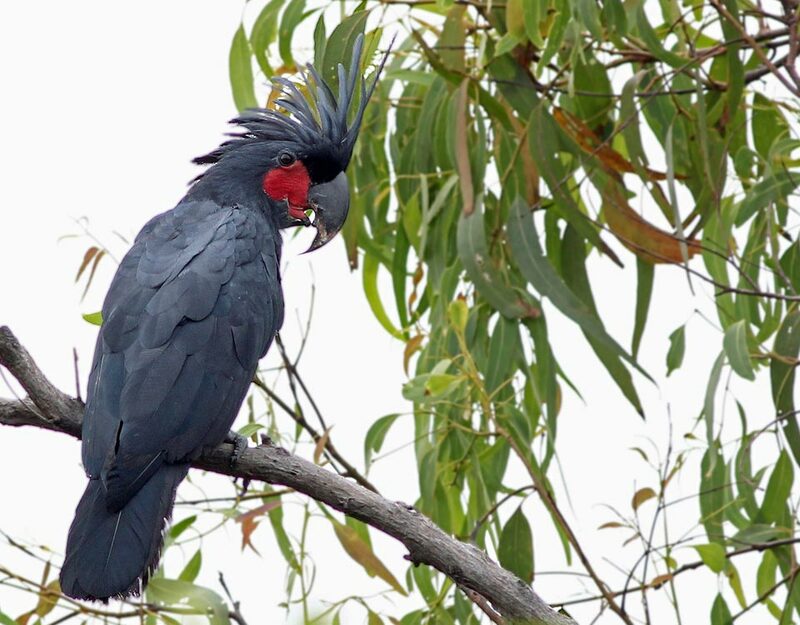 This entry was posted in Birding Reports, Far North Queensland. Bookmark the permalink.